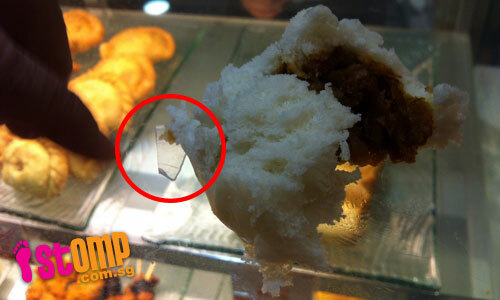 Singapore - STOMPer Steven bit into a BBQ pork bun that he bought at The Gallerie food court and discovered a two-centimetre long piece of plastic inside the bun filling. "I would like to share my unpleasant experience at The Gallerie by Koufu. "On April 6, my family and I were having lunch at the above premises in Marina Square. "As my daughter wanted a BBQ pork bun for lunch, I bought her two BBQ pork buns which came in a bamboo basket from the dim sum stall. "After consuming one whole bun and two mouthfuls of the second bun, she passed the remaining bun to me. "When I first took a bite, I thought I had bitten a bone. "When I spat it out, I realised that it was a chip of plastic in the filling. "Look at the picture where a finger is pointing, you can roughly see that the plastic chip was about 2 cm long. "I brought it to the counter and confronted them. "The lady behind the counter wanted to dispose of it but I took a picture when a customer advised me to do so. "Then a person by the name of Joe Kok came up to me. "He explained that they did not manufacture the buns, but their supplier did. "I insisted that they should stop selling the buns and asked them to let me know the outcome of their investigations. "He refunded me the money but to date, he has yet to respond to me."